I first met Michael Ganal, BMWs former chief financial officer, on September 28, 1998, near Turin. That day BMW was unveiling its C1, a motorcycle/car crossover, in the place it would be built -- Carrozzeria Bertone in Grugliasco. 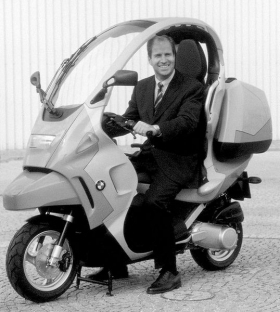 Ganal was the president of BMWs motorcycle division and the C1 was his pet project. The C1 was a visionary product. It was the first motorcycle a person could drive without wearing a helmet because it had a seat belt and a steel safety cage. BMW executive Michael Ganal died last month after a long illness. He was 54. Maybe it was too ahead of its time or maybe it was not promoted well after its initial slow sales start. Since then, I have met and interviewed Ganal, many times. One time I clearly remember was when he unveiled BMWs new vision of building cars to order. Other times were during broader (and endless) discussions about the role of the iconic Mini small-car brand within the BMW group. I always enjoyed talking with Ganal, a German-born lawyer who joined BMW in 1986, both for his frank and broad vision, which is common in the auto industry, and also for his genuine good manners, something that is not so common in the industry, particularly in these stormy days. For a while, I was the BMW correspondent for Automotive News Europe. That was not an easy period because of the unexpected accelerated retirement of then-CEO Helmut Panke. I considered Ganal to be one of the top three candidates to replace Panke and I was ready to print this. BMW sources gently suggested that I delete his name. They told me Ganal was fighting a serious illness so he was not a contender for BMWs top job. I was extremely sorry -- and also surprised -- because Ganal was doing his job as though nothing was wrong. He had asked for the news about his illness to be kept secret. In a small world like Europes automotive industry community, this was one of the very few secrets that was respected. The last information I had on Ganal, about a year ago, was that he had won his health battle and was fighting another battle: To maintain BMWs strong results of recent years. Unfortunately, this last piece of information was wrong. Ganal died aged 54 in the night between December 5 and 6. Everyone who loves this industry will miss him -- particularly those who love BMW cars. Ganal played a crucial part in BMWs big product expansion in recent years. I can only add this: Ciao, Michael. Thanks for helping me to understand a little better this terribly complicated industry.